@afneil Hardly surprising though. DC&GO still desperate for boundary changes. Interesting development wld be if LDs wanted deal. They don't. @TimMontgomerie @afneil no way LD's would back boundaries: undercuts their chief defence of embedded incumbancy. @polhomepulse vg on this. "@JGForsyth @GrantShapps tells @afneil been no talks w/ #LD's on party funding/boundary changes deal http://t.co/WCFYcAU5" < #staytuned! @marcusaroberts @TimMontgomerie @afneil @polhomepulse so does ANY form of electoral reform. Makes you wonder why LDs so keen in first place. @TimMontgomerie @afneil Agreed. Changes will not happen now come what may. @afneil A deal will be achieved. Most likely on party funding. @afneil I think Grant Shapps on #bbcsp has forced the LibDems into stating exactly why they don't believe in equality of representation. Grant Shapps has not "given up" on boundary changes. A bit like I have not "given up" on winning the pools. “@HouseofTwits: RT @SamSussex Grant Shapps rightly rules out an electoral pact with #UKIP #bbcsp” << Giving the game up already? Bye Bye Boundary Changes – Bye Bye General Election Victory? Is it all the Lib Dems’ fault? Have the turkeys banned Christmas? MPs put themselves ahead of the party? Was the new law too aggressive? What are your answers? Don’t keep them to yourself! Over the last few years, public-spirited individuals have developed various interfaces to let us make use of open-access government data. theyworkforyou.com is a great example, from the nice people at mysociety.org. The good thing is that the sites have been independent and even-handed, and don’t subvert the data by omitting part of it. There’s been a worrying development today with the launch of searchthemoney.com, a site that shows you where Tory MPs have been getting their money from. Only Tory MPs, mind. The data is available for all MPs, but the site hides the data for the other MPs. (For a while this morning, the pages for the other MPs were visible, but they were removed when the organisers realised their “mistake”.) This has been done in order to damage the Tory party’s chances at the next election, but the trades unions who are paying for the site need to have a good long look at themselves. 1. It’s unhelpful, confusing, misleading and dishonest. 2. It makes it look like Labour MPs have something to hide. 3. It will only be a week or two before the Tories get their anti-Labour version up and running. So instead of one honest website, we’ll end up with two dishonest websites. Well done. Something […] that will bite the dust in 2012 is the parliamentary boundary review. This was a rash promise by Cameron to slash 50 seats in order to “reduce the cost of politics” at the height of Westminster’s expenses scandal. The figure was entirely arbitrary, so the new proposed boundaries are a dog’s breakfast. And the electoral advantage the Tories confidently predicted is not looking as attractive as first thought. The seats of six cabinet ministers would be axed, including Nick Clegg’s Sheffield Hallam seat and George Osborne’s berth in leafy Knutsford. The last election was fought on fresh boundaries so there is, technically, no need to fiddle again for a decade. Eventually the government’s political antennae will twitch and the whole thing will be dropped. There is too much political fixing needed to keep everyone happy. The government has better things to worry about. 1. The figure of 50 seats was not “entirely arbitrary”. Both the decision to cut, and the decision that it would be 50, were made on the basis of Tory research on how best to make the system work more to the their advantage. “Reducing the cost of politics” was a convenient smokescreen. 2. The new seats are a “dog’s breakfast” but this is because of the radically new rules being used by the Boundary Commission, again decided on by the Tories to make the system work more to their advantage. The new system has at its heart the concept of “cracking” – which you should be au fait with – which tends to favour the Tories. 3. The new seats will be somewhat better for the Tories than the current ones. DGMW, the FPTP system will still favour Labour for the time being, but the precedent the changes are setting will gradually erode that advantage over the years. 4. Pickles and co. made the changes a priority in order to reduce and eventually eliminate Labour’s built-in electoral advantage as quickly as possible. They want to redraw the boundaries every five years in order to achieve this. At some point they must’ve briefed their MPs about the rationale behind this, and the fact that some of them will have to suffer for the benefit of the party. Trouble is, some of them will go rogue e.g. Dorries. 5. Considering how important the changes are to the Tory Project, there’s no way that Cameron will drop the whole thing, and the LibDems are too weak to challenge it, even though by supporting the changes they are tying the noose even tighter round their own neck. The opposition to the project must come from Labour, but instead of mounting an effective campaign, Greg Cook went round the country in the autumn licking the Boundary Commission’s arse. 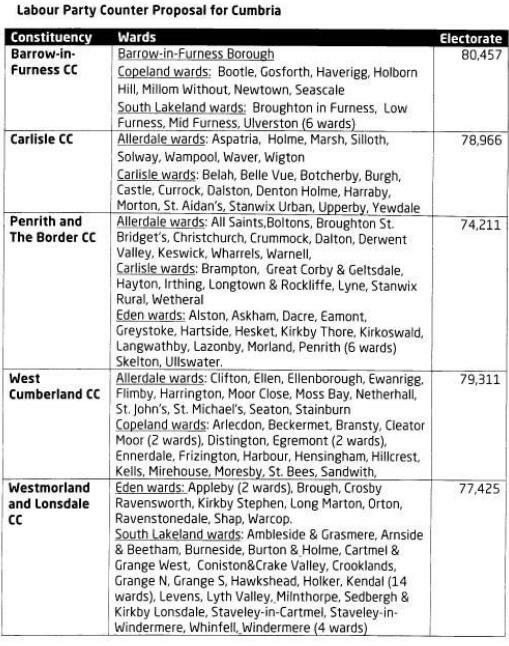 I haven’t checked the figures, though I can see that the Labour electorate for Westmorland & Lonsdale is wrong. 3. Kendal and Penrith have been put together but cut off from the areas they serve to their west. I think any of the three party counterproposals would be better than that. It’d be good to keep Appleby in the Penrith seat, but I can’t see a way to do it. The public enquiry into the new boundaries continues tomorrow (Tuesday 18 October) at Carlisle Civic Centre, but the message to the Commission seems pretty clear already. Although the Tories’ ideas are, on the whole, a bit better than both the Commission’s and Labour’s, it’s still disappointing that they’ve endorsed the Commission’s methodology. I suppose it’s difficult for the governing party to discredit in any way a supra-governmental (or is it extra-governmental?) body, but on the other hand they are the people who are best placed to do something about the incompetence of the Commission. Endorsing the Commission’s methodology brings them into direct conflict not only with common sense, but also with their local organisations and MPs. At the Chester hearings, MPs and party members lined up to criticise their own party’s counterproposals regarding Poynton, Henbury, Ellesmere Port, and Chester itself, inasmuch as those counterproposals endorse the Commission’s plans. Shame on their craven central office for hanging them out to dry! Why leave it to your individual MPs and councillors (as well as those few members of the public who understand the process) to suggest that the emperor is parading in the altogether? 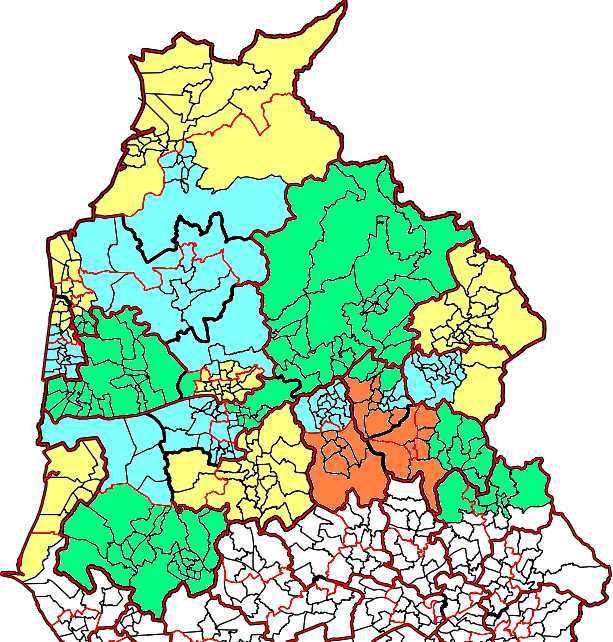 Because of Cheshire’s unique position at this Review (a non-metropolitan county with wards of over 10,000 electors each) the counterproposal is bound to be a failure if it doesn’t split any wards. Without splitting wards, the obvious idea of moving the Groves, Weaver and Boughton Heath wards clockwise into the seats they really belong in is made impossible by the fact that it would give Chester an electorate of 80,769. The Guide to the Review does say that ward-splitting may be justified under exceptional circumstances and Cheshire has the most exceptional circumstances in England! …I noticed that their Warrington South seat has two unlinked parts! And their Tatton seat almost does as well, the only link between Runcorn and the rest of the seat being Newton Lane. It’s also difficult to see the link between Cliviger and Pendle, but the general pattern in East Lancs is good. 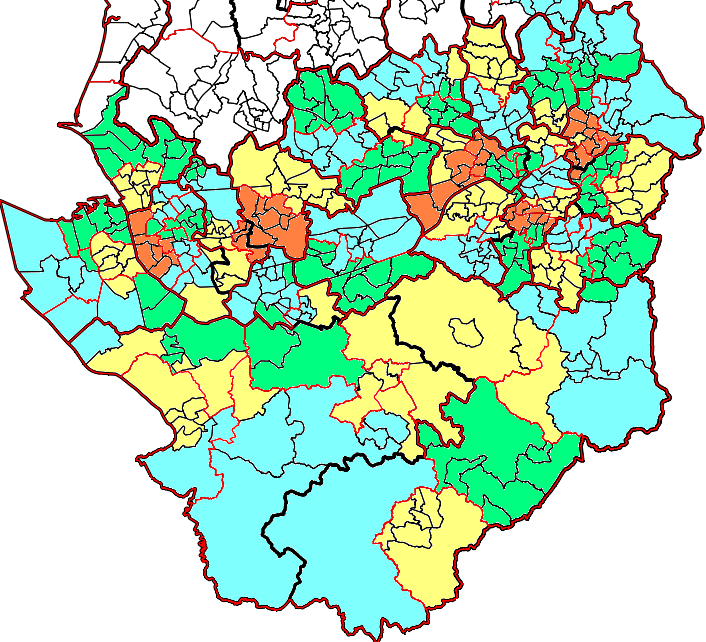 Their proposals make some headway on addressing the excessive border- and town-splititng of the Commisssion’s proposals, but they leave some new problems: Reddish, Chadderton, Royton, Clayton and Bredbury are all split, and arrangements in North Manchester are not ideal.